This on-road caravan has roller rocket leaf spring suspension. 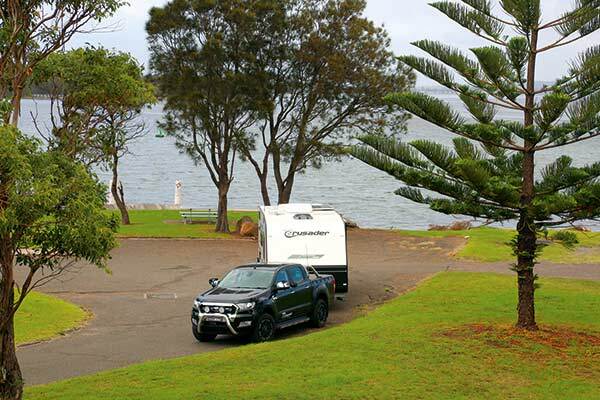 Just south of Wollongong, NSW, you'll find the Carlons Cars and Caravans dealership. Amongst the brands on offer is Crusader of which David Carlon keeps a good selection. In fact, so packed out is his yard, that it took us a while to extract the Musketeer Aramis model I was interested in. 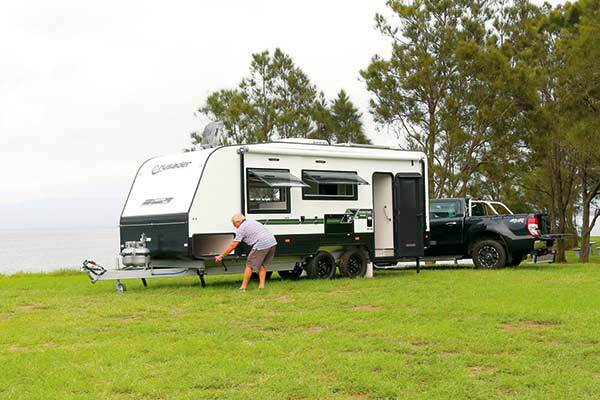 Crusader makes several ranges, and within its Musketeer line are various options ranging from single-axle to tandem-axle front bathroom layouts. In this case, I took out an Aramis 19 which is actually 6m (20ft 4in) long. Undoubtedly, the items of interest in this van are its weights (see Weights and Measures), and with a Tare Mass of 2085g, it could easily follow a Prado. Indeed, during my brief tow test, it handled the roads around Lake Illawarra with ease. Something I take an interest in with all vans is how they are constructed. Quite a few originating from outer Melbourne are built the same way, and some manufacturers are a bit coy about how theirs are made. I mention that because if you want to know some of the finer details about how Crusader builds its caravans, then the brochures are quite good but the website, if you dig around, is better. This Aramis has a very solid DuraGal box section chassis with 150mm (6in) rails and drawbar and roller rocker leaf spring suspension. Both the 95L water tanks are fitted between the chassis rails forward of the suspension mounts. The body has a Meranti timber frame and aluminium cladding on the walls. Differently, the roof is made from a one-piece fibreglass composite panel, which extends between the alloy checkerplate on the front and rear walls. Often forgotten about, the composite floor not only supports the walls and overall structure but also offers an effective insulation against the cold. The Aramis has all the usual external fittings, including a front through-boot, 9kg gas cylinders on the drawbar and a rear bumper, but there are also towel rails found on the front and back, which is an interesting idea. Looking slightly old-fashioned, they are none-the-less very practical. Also of interest is the Milenco Columbia door, complete with security door. Certainly, the lever mechanism to separate the screen from the main door was a little better than some I have seen. 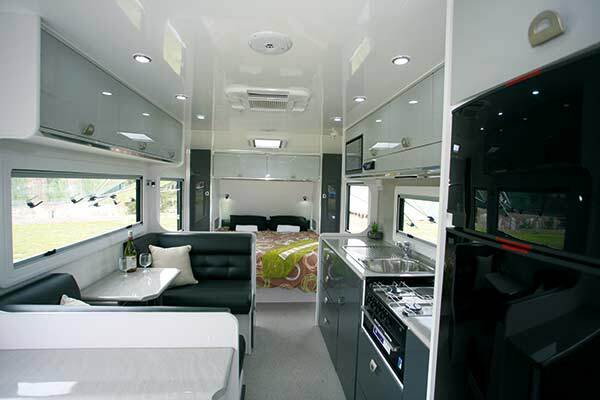 Inside the Aramis, the layout with a front bed and rear bathroom looks a bit familiar but the glossy white and grey palette teamed with black upholstery give the van a very contemporary look that's bright and breezy as well. A decent breeze is certainly possible if you open all the large windows, especially those in the front bedroom. 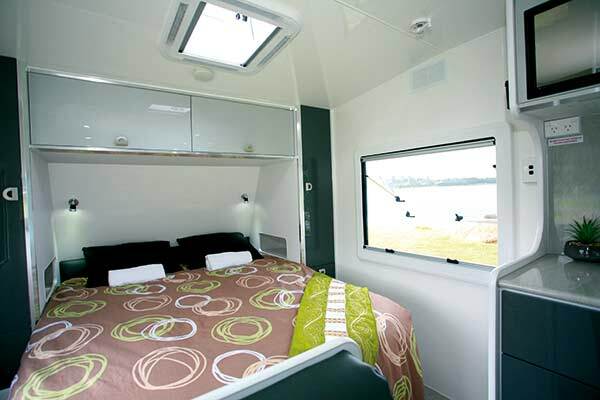 It, of course, is well equipped with all the expected features, including 1.88x1.53m (6ft 2in x 5ft) island bed, side wardrobes and overhead lockers. There are no bedside cabinets, instead, compartments are fitted in the base of each cupboard, which I reckon is a good idea for containing smaller items that may otherwise end up on the floor. Despite the dinette being set back on one side and the kitchen bench on the other, walk around space hasn’t been compromised too much. 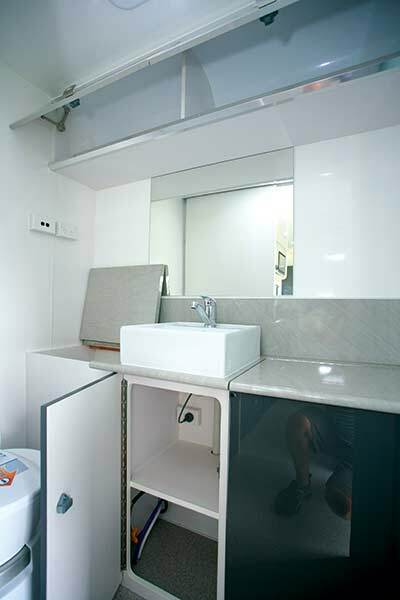 Also without too much design/function compromise is the kitchen bench, which comes with four good-sized drawers, two floor lockers, a cupboard and a couple of overhead lockers. There’s a reasonable amount of benchtop area, even with both a stainless steel sink/drainer and a Swift four-burner cooker and grill. I suspect if you also desire an oven, you’d lose a drawer. Between the bench end and the bathroom wall, the cabinetry contains an off the floor mounted 190L three-way fridge. The cafe style dinette allows for four at a squeeze but its proximity to the wheel arch means it's better for two. Under the multi-fold table, a small cupboard has both a double power point and USB charger outlet as part of the power point panel, which is so much neater than the rather ugly surface-fitted 12V/5V outlets often used. In a way, the power point in the cupboard is a bit fiddly to get at but it's far better than tripping over leads that are plugged into the base of a seat. Behind the dinette, i.e., in the doorway, extra storage is supplied by a narrow, multi-shelved cupboard. It’s useful for items both inside and outside the van. Washing machines are almost expected these days and in this Aramis, you'll find it fitted neatly into the bathroom cabinetry, along with a cupboard that you could conceivably use as a dirty linen bin! 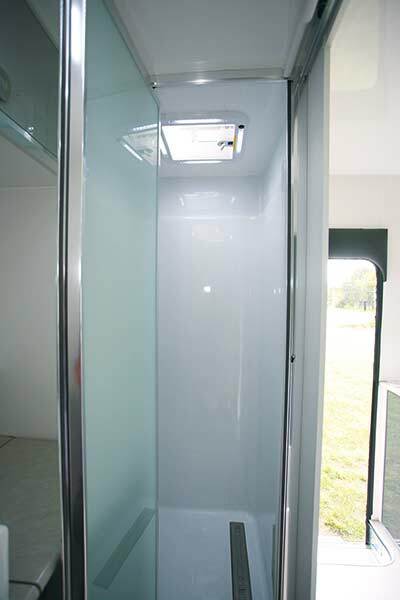 You get, of course, the other expected items like a shower cubicle and Dometic cassette toilet and a washbasin. Electrics are fairly basic (a relative word) but given this is designed as an on-road caravan, the 105Ah battery and 150W solar panel should be more than adequate, especially with the three-way fridge. LED lighting is fitted as standard. 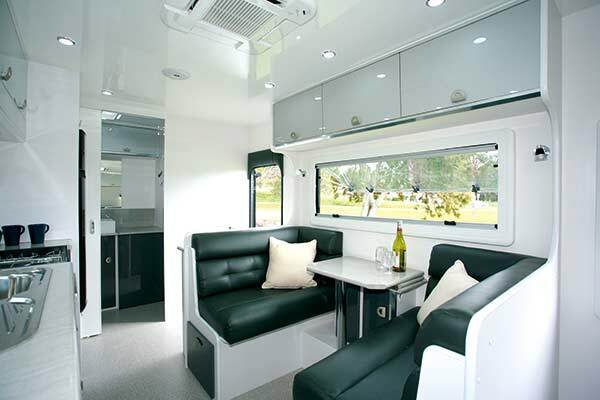 The Aramis seen here has a fairly a standard layout, which is quite well proportioned in itself, but there are many more to choose from to suit your preferences and needs. 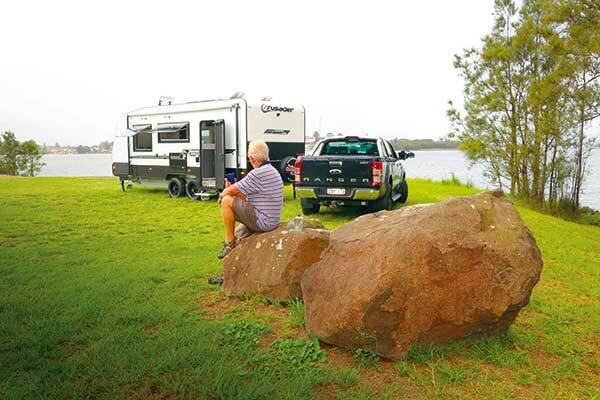 In addition, the high payload allows for a good range of tow vehicles, especially for those who are prepared to travel light.